My parents moved house last week. They weren’t, though, the only inhabitants of their property to relocate. During their final few days of packing, a swarm of bees took up residence in my sister’s old tree house. Unfortunately for the bees, there was no way that they could safely establish a hive there, so my mother called Gerald the Bee Man, who put her in touch with a couple of local beekeepers. They lulled the bees into submission with smoke, and then coaxed them into a new hive over the course of two days. The queen and her underlings will spend the rest of their lives pollinating fruit trees, far away from the temptations of suburban tree houses. Deciding to remove, rather than exterminate, errant bee colonies has implications beyond the ethics of killing animals and insects. Bees exist not only to make a cheerful buzzing in our gardens and to provide us with honey. Einstein remarked, famously: ‘if the bee disappeared off the surface of the globe, man would have only four years to live.’ Although this is something of an exaggeration, I can understand his terror at the thought of the disappearance of bees, both culturally and ecologically. Yesterday they were treated to various dissertations on the abject misery of the poor white population, and yet they were now asked to consent to the second reading of a measure which would deprive the poor white population of the country of one of the most useful object lessons they could possibly be afforded them. For the Victorians, the appeal of the beehive lay in its tightly organised and maintained social structure, its strict hierarchies, and its efficient productivity. It was at once a metaphor for a harmonious society and a well-run factory. Bees are also useful for describing our often fraught relationship with nature: I think of the periodic, National Enquirer-esque hysteria around killer African bees invading the United States. I wonder if the horror of Roald Dahl’s story ‘Royal Jelly,’ where a beekeeper accidentally turns both himself and his baby daughter into bees, was reflective of wider anxieties about the implications of human tampering with nature during the early 1980s. honeybees are vital for the pollination of around 90 crops worldwide. In addition to almonds, most fruits, vegetables, nuts and seeds are dependent on honeybees. Crops that are used as cattle and pig feed also rely on honeybee pollination, as does the cotton plant. So if all the honeybees disappeared, we would have to switch our diet to cereals and grain, and give our wardrobes a drastic makeover. The disappearance of the world’s bees has significant implications for our food security. Ensuring that we have enough to eat is linked to health of our pollinators. The decline in European bee populations began in the 1960s, but since the late 1990s, this has both accelerated and spread around the globe. Between 1985 and 2005, managed honeybee populations declined by 20 per cent across Europe, and 54% in England. In the United States, four of the main bumblebee populations have diminished by up to 96%. In Britain, three of the region’s 25 bumblebee species are now extinct, and half of the remainder have declined significantly, some by as much as 70% since the 1970s. showed more than half the wild bee species were lost in the 20th century in the US. It made use of a remarkable record made of plants and pollinators at Carlinville, Illinois between 1888 and 1891 by entomologist Charles Robertson. Scientists combined that with data from 1971-72 and new data from 2009-10 to discover the changes in pollination seen over the century as widespread forest was reduced to the fragments that remain today. They found that half of the 109 bee species recorded by Robertson had been lost and there had been a serious degradation of the pollination provided by the remaining wild insects, with their ability to pollinate specific plants falling by more than half. There was an increasing mismatch between when plants flowered and when bees were active, a finding consistent with climate change, according to the researchers. So it’s not just various species of honeybee which are dying, but bumblebees and wild bees too. So why are they disappearing? Scientists all over the world are still trying to answer this question. Initially, the dramatic decline in bee populations from around 2005 were ascribed to a mysterious Colony Collapse Disorder – also called Marie Celeste Syndrome – where whole, apparently healthy, beehives seemed to die overnight. In 2007, a third of beehives in the US were wiped out in this manner. In the same year, ten million bees were reported to have died in just a fortnight in Taiwan. 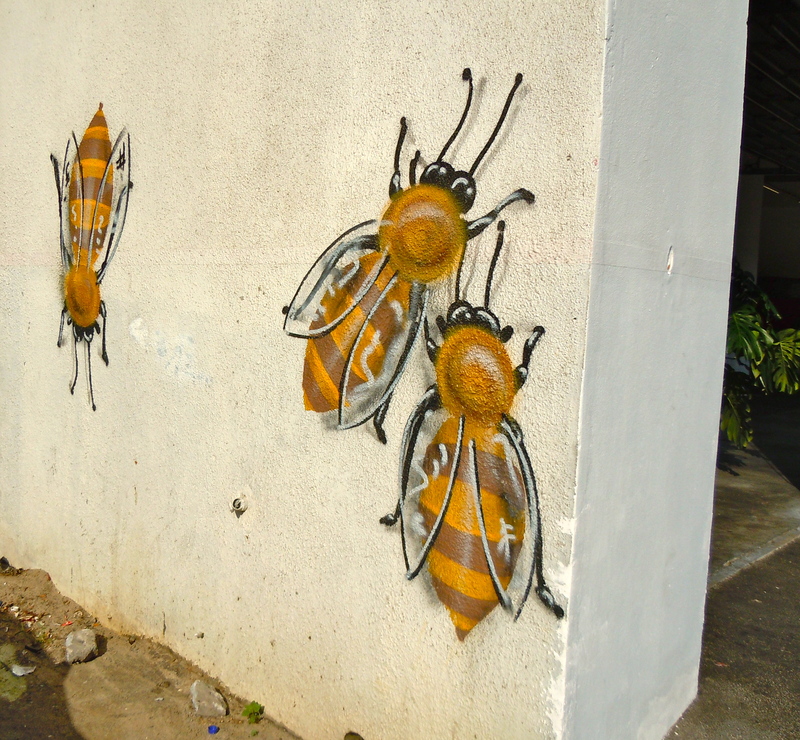 In the winter of 2007/2008, a fifth of British beehives disappeared too. Varroa destructor has spread from Asia across the entire world over the past 50 years. It arrived in the UK in 1990 and has been implicated in the halving of bee numbers since then, alongside other factors including the destruction of flowery habitats in which bees feed and the widespread use of pesticides on crops. Bees and other pollinators are vital in the production in up to a third of all the food we eat, but the role the mites played was unclear, as bacteria and fungi are also found in colonies along with the viruses. But the mite’s arrival in Hawaii in 2007 gave scientists a unique opportunity to track its deadly spread. ‘We were able to watch the emergence of the disease for the first time ever,’ said Stephen Martin, at the University of Sheffield, who led the new research published in the journal Science. Within a year of varroa arrival, 274 of 419 colonies on Oahu island (65%) were wiped out, with the mites going on to wreak destruction across Big Island the following year. Scientific evidence has mounted rapidly since March 2012, when two high-profile studies found that bees consuming neonicotinoids suffered an 85% loss in the number of queens their nests produced and showed a doubling in ‘disappeared’ bees who got lost while foraging. Neonicotinoids have been fiercely defended by their manufacturers, who claim there is no proof of harm in field conditions and by farming lobbies who say crop yields could fall without pesticide protection. Some neonicotinoid uses have been banned in the past in France, Italy, Slovenia and Germany, but no action has yet been taken in the UK. The removal of the hive from my parents’ garden made me wonder to what extent CCD has affected South African bee populations. And the answer – I think – is that local bee numbers appear not to have declined as dramatically as those abroad. I’d like to qualify this statement heavily: this is the conclusion I’ve drawn after a morning’s worth of fairly thorough research. I’m not a melittologist (obviously) and I may well have missed a few vital and obvious studies. Bees are certainly under threat in South Africa. As the South African Bee Industry Organisation notes, habitat loss and the arrival of foreign parasites have taken their toll on bee populations. Also since 1990 a problem has emerged caused by the movement within South Africa of colonies of the endemic Cape honeybee (Apis mellifera capensis) to regions outside its natural distribution. The interaction between these Cape honeybees and colonies of the other honeybee species in South Africa proved to be disastrous. The so-called Capensis Problem caused extensive damage in the beekeeping industry in South Africa. Interestingly, though, South Africa’s bees seem to be more resilient to the threat posed by the varroa mite. The mite was first identified in the Western Cape in 1997, having probably entered the country in contaminated hives offloaded at Cape Town harbour. It then spread around the country, even infecting wild bee populations. But only a small minority of bee colonies have collapsed so far. African subspecies disperse via long-distance migratory swarms, leave the nest in response to disturbance or disease (absconding) more readily, and have a faster generation time and smaller colonies than European honeybees. These traits promote population gene flow and high genetic diversity, boosting effective population sizes in Africa. Agriculture, with its pesticides and low biodiversity, seems, then, to have an impact on the health of European bee populations. Looking at the comparative good health of South African bees suggests ways in which the global bee population could be increased. Limiting the use of pesticides, increasing habitat for bees by planting wild flowers and leaving areas of uncultivated vegetation on farms, and finding ways of preventing the spread of parasites, will all assist in encouraging healthier bee colonies. All over the world, campaigns and organisations have emerged to lobby for the protection of bees, and the coolness of urban beekeeping is linked, I’m sure, to wider concerns about declining biodiversity. A world without bees, is a world which will struggle to feed itself. Alison Benjamin and Brian McCallum, A World without Bees (London: Guardian Books, 2008). A wonderful blog entry Sarah! I especially enjoyed the cross-disciplinary aspects. And it made me exited about the histories of little critters and humans again. Thanks! Really glad you enjoy it. I do hope I’ve got the science right, though. And seriously, the language on this http://www.columbia.edu/itc/cerc/danoff-burg/invasion_bio/inv_spp_summ/Apis_mellifera_scutellata.htm is ripe for unpacking, (and probably has been unpacked).